The Windlass Wreck gets her name from her highly photographed 10 foot long iron winch located at spectacular Molasses Reef. 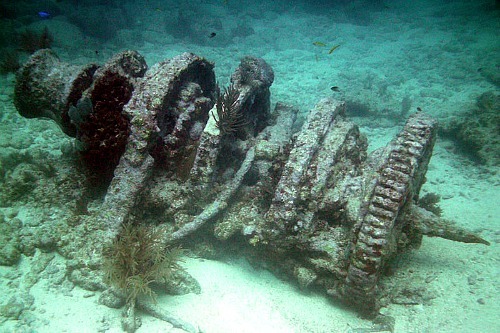 This, along with some ballast, mast pieces, and a few of her gears are the few remnants you'll discover at this Key Largo diving site. This 3 masted wood schooner is actually the remains of the 1,100 ton Austrian Slobodana which sank in 1887, 3 years after being built. Today, the resting place of this shipwreck is just east of the Molasses Reef Lighthouse between M7 and M8. Two factors were critical in her eventual sinking. First she had grounded on one of the Florida reefs. The repetitive motion of waves and tide continually pressed the ship against the sharp coral. This in turn caused lacerations to form in her wooden hull. The second important factor was her aforementioned cargo. She was returning to Reval which is now Tallinn in Eston after a visit to New Orleans and her cargo was 4,500 bales of cotton. Of course cotton is very good at absorbing moisture, and once the water began to seep in, the cotton began to expand. Not only did the cotton increase in size, it increased in weight. This caused the ship's sides to bulge. Between the outward pressure being exercised on her damaged hull, and the extra weight she was now holding, the ship finally broke and sank. Thanks to Steve Singer, author of "Shipwrecks of Florida", published by Pineapple Press, he was able to uncover additional information about this Florida shipwreck. One point of interest is that her correct name was Slobodna, not Slobodana. Also according to Steve Singer's research, he uncovered information about a temporary judgement or interlocutory decree that Judge Locke out of Key West made in terms of the salvage from this wreck. Judge Lock's decision for the salvagers was 25% on dry cotton, 33 1/3% on partially wet cotton, 40% on cotton taken from 6' of water, 50% on the balance and 45% on materials saved for a total of $53,000.00. As anyone who's been diving Key Largo knows, the Slobodna couldn't have picked a more beautiful final resting place. Molasses Reef is one of the most spectacular Florida Keys diving sites you can explore. 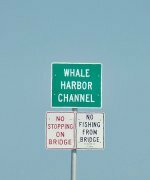 In tribute to one of her more recognizable remnants, a place on Molasses Reef has been named Winch Hole. If you're scuba diving in Key Largo and plan a dive trip to the Windlass Wreck, you'll be impressed by the tremendous display of coral, ocean sponges, tropical fish and juvenile game fish. However, it's not just the color and quantity of the marine life around you that's exceptional - it's also the clarity of the water. This Key Largo diving site is blessed by it's proximity to the Gulf Stream which flushes the area and keeps the water brilliantly clean. The combination of ultra clear water, abundant, colorful marine life, and shallow water to about 23 feet, anyone Florida Keys snorkeling is also able to enjoy a dive trip to this wreck site. Mostly disintegrated except for the winch, masts, and a few gears. Without question, this is one of those Florida Keys diving or snorkeling sites you don't want to miss. Here you'll have the opportunity to examine the wreckage of a once glorious schooner while enjoying one of the world's most beautiful, and captivating underwater areas.